That not only engage your community and church members, but look professional. If you're serious about your appearance, then a template simply won't cut it. Initiate Church Websites are all custom designed. Impressions count. In fact impressions are everything. Powerful tools. At your service. The majority of visits to your website will be on mobile, so we'll ensure you look good there. And on iPad. Desktop goes without saying. 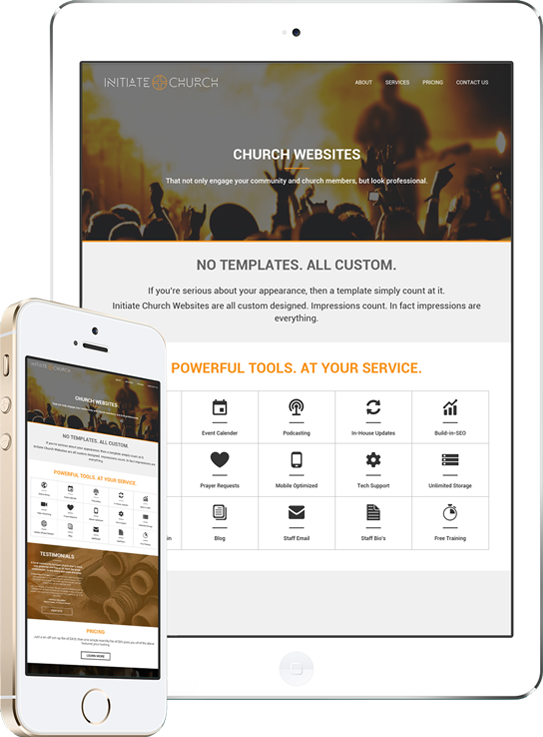 Initiate Church Websites are all built with intelligent responsive design features, refining your website to fit on a smartphone, tablet or desktop. Our new website is fantastic. We are more than delighted with the features that we have received, but our design is also just as we wanted. We are proud to encourage our congregation to go to the site often. Just a one-off set-up fee of $499, then one simple monthly fee of $59 gives you all of our features.